Stargazing telescopes have a lot of different components and moving parts, and you should become familiar with all of them and how best to care for them before you use the telescope for stargazing. Following are a few initial tips on handling your telescope before and after use. Setting up your telescope indoors first is always a good idea so that you can see what you’re doing. Setting it up outside at night, whether it’s the first or tenth time, is very tricky, so you’ll want to get the hang of it when you can see what you’re doing. 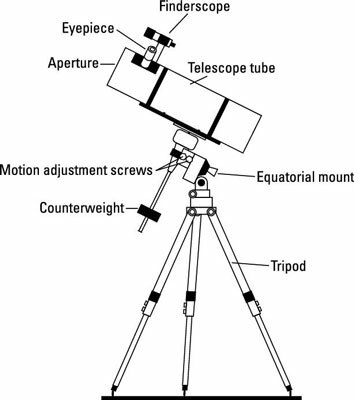 The figure shows a typical telescope setup. Make sure that you have all the parts and that they’re all working properly. You may want to find a small box to store all the loose parts in while they’re not in use – the eyepieces, the front cover, the lens caps and so on. To get the best out of your telescope in cooler weather, set it up outside an hour or so before you’re about to use it, to give it a chance to cool down. If you take your telescope from a warm room indoors to cooler temperatures outside, then the telescope metal and the air inside the telescope tube will be hotter than the cooler night air. This difference in temperature can make the air move inside the telescope, giving you a wobbly, blurry image. Make sure that all the covers and lens caps are still on your telescope, to prevent moisture forming on the important bits. If, when you take your telescope outdoors in the evening, you’re not sure what the weather has in store, let your telescope cool down under some shelter, just in case it rains! Telescopes are fairly simple devices – really just long tubes with either lenses or mirrors inside – but you’ll still need to care for them properly when they’re not in use. Having somewhere safe to store them is important, because any knock, bump or dent may damage the glass or knock the mirrors or lenses out of alignment, making the telescope next to useless. Keeping your telescope dry and away from excessive condensation and moisture is important, too. Any buildup of water on the lenses or mirrors may mark their glass, making them far less effective. Many keen astronomers, after they’ve invested in a large telescope, start thinking about building or buying an observatory – a building with a rotating or removable roof where you can store your telescope safely in the daytime and use it at night without worrying about carrying it outside and setting it up. You can buy off-the-shelf observatory domes in a variety of sizes, as well as flat roll-off-roof observatories. Before you buy an observatory or start building your own, make sure you have a good site for it. The area needs to be fairly exposed, well away from trees and buildings that may obscure the view, and so most astronomers site their observatories on the top of a hill. You may not have such an opportunity, and you may have to put your observatory in your garden or a nearby field, but you should still watch for anything that may potentially block your view. You’ll want to make sure that there aren’t any bright outside lights nearby too, because these can spoil the view.